A friend of mine has visitors in town who had heard about the Lunch Lady made famous by Anthony Bourdain. With dining at a celebrity sidewalk café a strong motivator to jump into more off the beaten path parts of Saigon, the four of us set out on a culinary pilgrimage to sample the Lunch Lady’s Thursday menu. And as you know by now, this conical hat wearing purveyor of street treats serves a day specific meal at a bargain buck fifty price. This highly affordable food is an experience both priceless and unique. And as a side note, when I am going to finally cross paths with Bourdain at this sidewalk stand in District 3 near the Nguyen Thi Minh Khai bridge? Thursday is indeed my favorite so far. 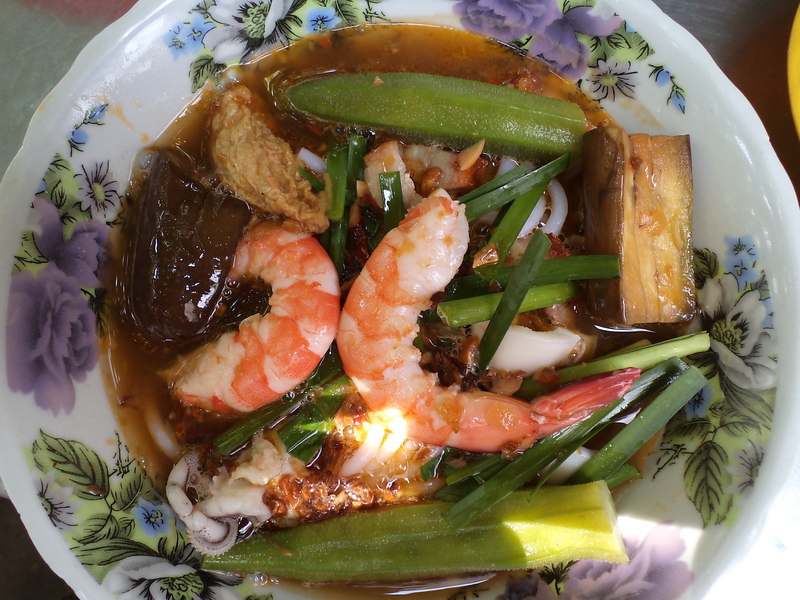 A seafood based soup with slight onion undertones is laden with giant shrimp, squid, crisp okra, sweet Chinese eggplant, nutty fried garlic, and spongy fried fish cake. Fat, round rice noodles round out the slightly sweet broth, and I really have no idea what this concoction is called in Vietnamese. 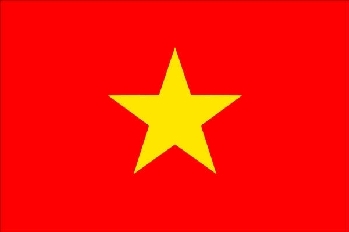 Showing a picture of lunch to three Vietnamese friends was of no avail. One just gave the picture a long blank stare and the other two nervously giggled while covering their mouths. Not one to give up, I harassed three more victims of my ignorance as to what we had eaten. One said, “I do not know. Must taste to know.” The other two answered with that most ubiquitous giggle while saying maybe someone else could help. Hoping the seventh time would prove the charm, I solicited one more opinion, and he said, “Yes. It is soup.” Of course by now I was thinking thank you Einstein for that sage observation, but I kept my thoughts to myself of course and bit my tongue. Now if someone showed you pictures of a Big Mac or Whopper, you could quickly and accurately identify them, right? I mean come on now. How hard is this? It’s a soup with readily identifiable shrimp, okra and more. If you showed me a crappy tortilla stuffed with dog squeeze looking meat paste, I could tell you beyond a shadow of the doubt it’s a Taco Bell Beef and Bean Burrito. Well, it is my own darn fault here. I should have just shoved paper and pen in the Lunch Lady’s face so she could write down the name for me. Lesson learned for next time! Even if we can’t readily identify the meal, eating under the Lunch Lady’s awning down a back alley is an experience needing no translation. Laundry hanging out of windows, people drinking their ca phe sui da at sidewalk cafes and pushcarts full of street food desserts rolling on by definitely lend a backdrop that is the authentic Saigon I seek. If after two years here these types of experiences never become old, I cannot imagine the sensory overload for anyone new to it all. I am glad Bourdain has made this ordinary lady an extraordinary addition to Saigon’s food scene. Hopefully more and more people will discover what we already know to be true…the food here in Vietnam is amazing even if we never quite figure out what it is. What’s in a name anyhow? The taste is where it’s at. Bon appetit!